The little girl was playing at the end of the garden. She had decided, on this warm summer’s afternoon, that she was going to be an archaeologist. Equipped with her beach bucket, a little plastic spade and a big brush borrowed from her father’s workshop, she began digging beneath the walnut tree. She sank her knees into the damp earth and scraped away at the ground, sometimes with her spade, sometimes with her nails. According to her map, which was cut out of a book about pirates she had gotten from the library, there should be treasure not far away. When the first hole yielded nothing, she went around to the other side of the tree to make a second one. Suddenly, a little shiny object caught her eye. No need to dig, after all. The little archaeologist, brush in hand, went up to her discovery and examined it more carefully. It was an egg. A tiny egg no bigger than her thumb and as glittery as a gemstone. The child took the egg in the palm of her hand and, abandoning all her equipment, ran back up to the house. Her mother was busy making a chocolate cake in the kitchen, while her father was in his workshop, complaining about a brush that had mysteriously disappeared. The little girl slipped noiselessly up to her room. She took a bed from the doll’s house her father had made for her, placed the strange little egg on it and put it under the warmth of her bedside lamp. Now she was no longer an archaeologist, she was an Eastern princess who had just been presented by a suitor with a future bird of a very rare species. She opened her closet, slipped on a pretty turquoise dress and stuck a tiara on her head from which she hung an iridescent scarf belonging to her mother, then she sat down on her bed facing the egg and waited. Soon, her mother called her down for dinner. A delicious smell of chocolate wafted through the house and came to tickle her nose but she resisted. She did not want to miss the hatching of her exotic bird. She heard her mother coming up the stairs. She hid the egg behind a teddy bear and sat up on her bed as if she was on a throne. Her mother closed the door, smiling, and went back down to the kitchen, where she put her cake in the fridge for later. The little princess, tired of doing nothing while she waited, decided to organize a ball to celebrate the imminent birth of the fabled fledgling. She arranged her soft toys in a circle, and with a doll in her arms, began to dance, humming to herself, among these guests who had come from the four corners of the earth in honor of the new nestling. That was when she heard a little crack. 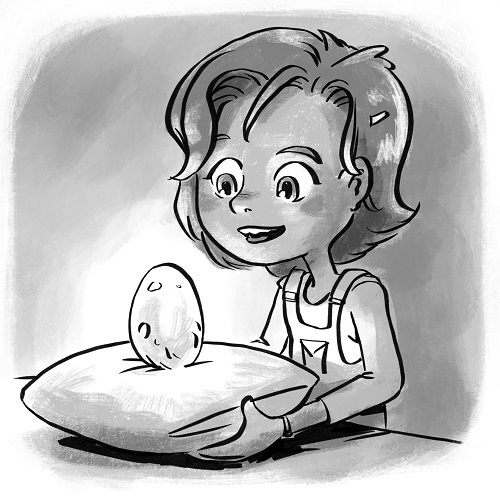 The little girl dropped her dance partner and turned to the egg, staring wide-eyed. Bigger cracks gradually appeared, then, suddenly, the sparkling shell burst open! A strange little creature unfolded its wings. It was completely naked and all wet but it sparkled even more than its shell. It was not a bird, not even an exotic bird, it was a fairy! The little girl was struck dumb by this apparition, which went beyond her wildest dreams. The fairy stretched and shook her wings. She took off and alighted in the doll’s house, in front of the mirror, in which she admired herself for some considerable time. In the end she turned to the child who was still staring at her. She rubbed her hands together and blew on them. With that, she disappeared, both from the room and from the child’s memory. The little girl was playing at the end of the garden. She had decided, on this warm summer’s afternoon, that she was going to be a fairy. Equipped with a magic wand which bore a strange resemblance to a dead branch, and a wicker basket full of flowers, she began to dance under the walnut tree. First she hummed and soon she was singing a song she had made up about the hatching of a strange bird. She didn’t really know where that idea had come from but she liked it and wanted to tell her parents all about it. In fact, she wanted to tell loads of stories. Starting tomorrow, she was going to be a writer. Then she would be able to share her adventures as an archaeologist, a princess, a fairy and a bird. Perched on a branch high up, a little winged creature laughed as she watched the girl dancing. It was not a bird, not even an extraordinary bird, it was a fairy! The fairy of imagination and inspiration. Wow. Loved this story. Write more.